a lovely 1 bed flat with a balcony over looking weymouth beach and sea, with a view of weymouth observation tower which was built for the 2012 olympics. i suggest you should go if your not scared of heights. lol... this flat is available all year round. the flat is part of a house built around 1880, full of character and history. i love my flat and i would like, like-minded people to relax and enjoy my flat and the beautiful views that comes with it. whether you visit during the summer and enjoy the sun, which streams through early mornin or visit autumn, winter and experience the beautiful sunsets and get blown about whilst you walk along the beach, its FAB. Portland bill is just 10 minutes drive in the car or catch the bus that runs every 15 minutes till midnight. weymouth has plenty of places to eat and at reasonable prices. visit for a few days, a week or more i am flexible and open to wotever. 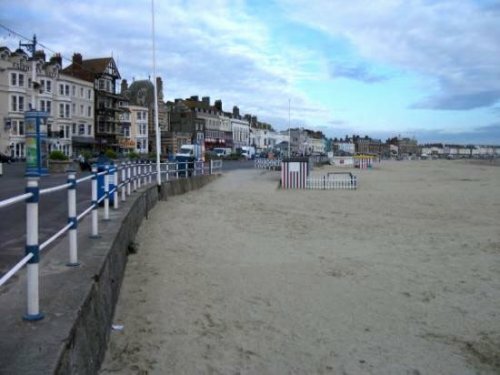 relaxed and easy , weymouth offers a wide range of activities and dogs are still allowed on part of the beach during the summer, and from september dogs are allowed on all parts of the beach. you will enjoy a nice relaxed break here, a stone throw from the night life but just far away from the hustle and bustle, you wont be disturbed. come and enjoy and experience lovely weymouth made more famous by the 2012 olympics.